The waft of a BBQ drifting through a balmy evening is a rare, but wonderful, pleasure when the summer sun puts in an appearance. Many people opt for gas-fired BBQs, but a family-owned company in Herefordshire, Certainly Wood, are encouraging people to use British logs as an alternative to gas and even charcoal. Based in the heart Of Herefordshire, Certainly Wood grows and manages its own woodlands from which it sources it trees for logs. It also buys in British wood from close to home too. Only the trees, which need to be felled are chosen, so that the woodlands can thrive and support a range of wildlife as well as providing a place of sanctuary for people too. The logs are then seasoned before being kiln-dried and sold to customers. The benefit of kiln drying means that what you’re burning is wood and not water. Many European imports are so water-logged, if you’ll pardon the pun, that the smoke and debris they give off when lit can cause chimney fires. But the logs are not only great for wood fires and stoves, they’re ideal for cooking too. 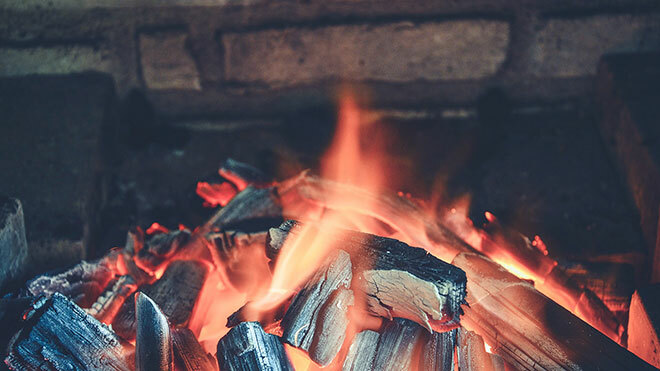 Lighting a fire is easy – whether it is a barbecue, firepit or a simple campfire, or inside for an open fire or wood-burning stove, the principles are the same. For the easiest way to light a fire, use firelighters, kindling and DRY firewood. Have a range of log sizes, starting the fire with smaller pieces and using the larger pieces for the long steady burn. Airflow is crucial, so always place logs at a vertical angle with plenty of air gaps in between. Give the logs time to burn and add more as required to build a good base to the fire. The more heat in the base, the easier it is to keep the fire going. Step 1: Take 8 pieces of kiln-dried kindling and stack neatly in a crisscrossed pattern similar to a Jenga tower. Place a single Flamer firelighter into the middle of the kindling. At an angle, lie 2–3 smaller logs across the kindling. Step 2: Light the Flamer and leave for approximately 5 minutes until it is burning well. Step 3: Add 2–3 more logs at a vertical angle allowing a good airflow between them and leave for a further 10 – 1 5 minutes. Step 4: Add 3 – 4 more logs until the fire has a good base of heat and the logs start to turn white. This will now be perfect to begin your gastronomic greatness. Hardwoods such as oak, ash and beech are best for cooking heat, as they provide a good long burn and give a great flavour too. Fruitwoods such as apple can also provide fantastic flavour. Softwoods such as spruce and pine will burn faster and at times may be too hot. They also contain higher levels of resin, which can turn to bitter-tasting creosote when burned. 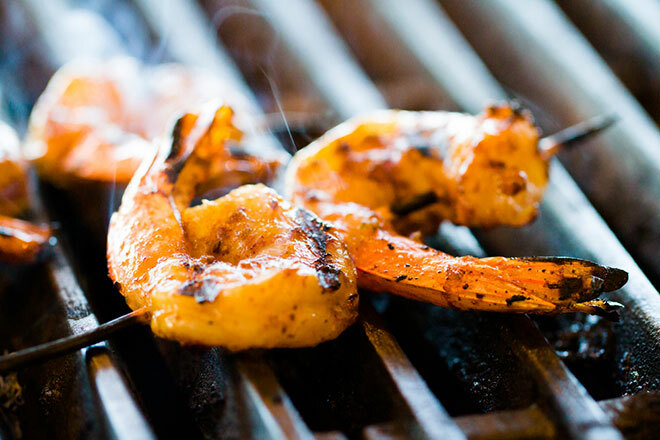 Many modern barbecuers are adding a little hickory or mesquite near the end of the cooking time for an extra smoky flavour. Wood MUST be dry and below 25% moisture content to provide the best heat and avoid excessively smoky fires. Avoid chemical-based fire igniters when you intend to cook food on your wood fire. Fire starter gels often contain chemicals such as kerosene to make them easy to light and long-burning. 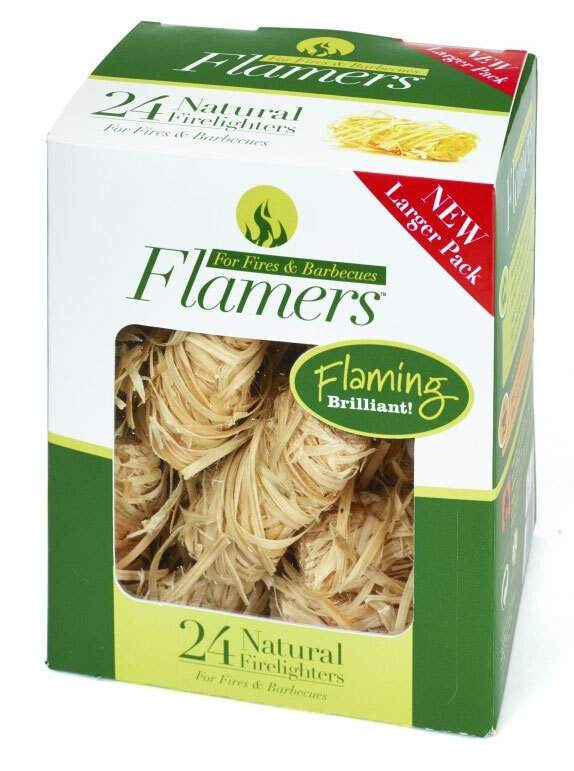 We highly recommend Flamers natural firelighters, which are easy to light and have a strong, long burn. When cooking with wood, aim for a bed of hot wood coals or embers, not flames. Use indirect heat to cook food more slowly and evenly. Push your embers to one side of the firepit or BBQ and put your food on the other to cook. The hot embers are perfect for cooking things like potatoes wrapped in foil. Use a hand-held rake with a long handle and metal head to rake the embers around to control the temperature. 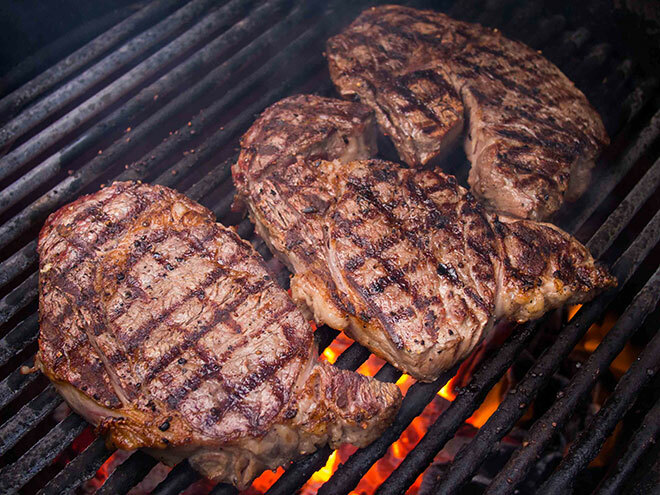 Different meats cook differently. Small pieces of meat such as chicken breasts cook best over a medium heat. For a larger joint such as a pork roast, get the meat close to the fire for the first few minutes, turning it to seal in the juices, and then move it away from the high heat so it can cook slowly over a gentler fire. World BBQ champ Ben Bartlett loves cooking on wood and has created a whole book of recipes to encourage people to follow suit. After all it was the first fuel man used to cook with and a wood fired BBQ imparts great flavours. It is carbon neutral too so greener, cleaner, and tastier all round! Simmer 1 hour, stirring often or until as thick as cream. Use plain or strain. If frozen, defrost the langoustines thoroughly. Butterfly the langoustines by cutting them through the back, then turn them over, and press flat. Place the langoustines in a zip-lock bag with all the ingredients and marinate in a fridge for 30 minutes. Cook on a high heat, shell-side down. Combine all of the ingredients for the marinade in a food processor fitted with a metal blade. Place each steak in a zip-lock bag and pour the marinade over it. 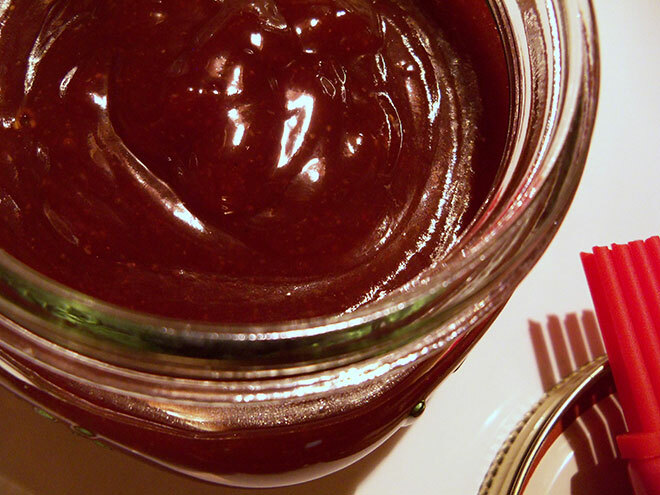 Allow to sit for two hours at room temperature or overnight in the fridge. Place the meat on a hot barbecue and grill to your liking, then slice into strips. Melt the chips in a tray made from foil at the cooler edge of the BBQ. Place a marshmallow onto a wooden skewer and toast over a medium/high heat for a couple of minutes until slightly charred and gooey. Dip the marshmallow into a foil tray ¼ filled with melted chocolate. 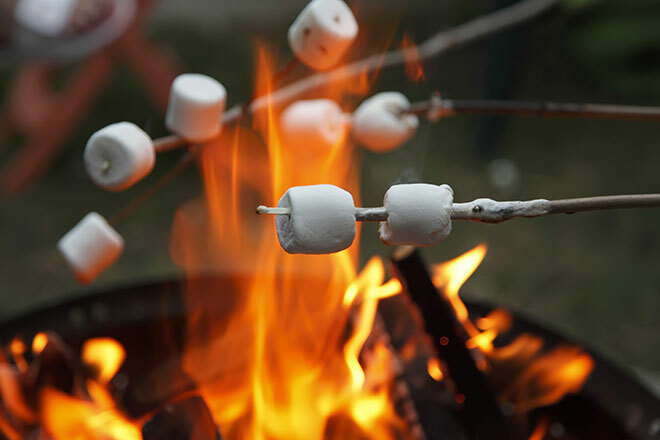 You can’t have a campfire without toasting marshmallows, and children love them! Combine the Worcestershire Sauce, honey, butter, sugar and rum in a saucepan. Bring to a full boil over medium-high heat, stirring frequently. Reduce the heat to medium-low and simmer for 10 minutes, or until the sauce is slightly thickened, stirring frequently. Remove from the heat and allow to cool completely. 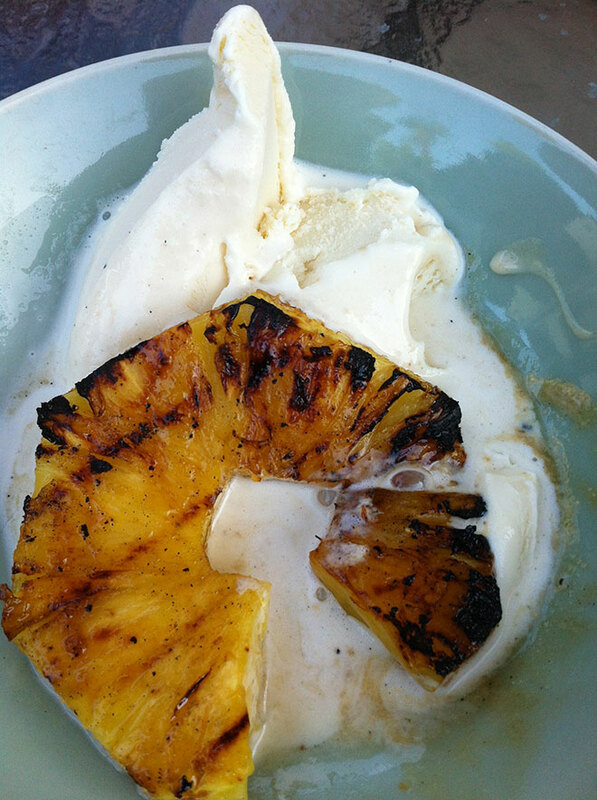 Brush the pineapple wedges with some of the sauce and place them on an oiled grill. Cook on a high heat until glazed, turning and basting frequently with the sauce.